From bras to batteries, Japan is no stranger to unusual vending machines. But its latest peculiar vending machine might make sense. Kinda! 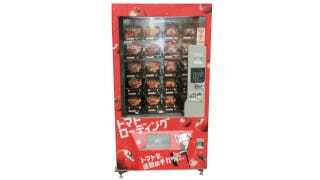 Japanese food company Kagome, which specializes in tomato-based eats, recently installed a vending machine at a runner's facility in Tokyo. According to The Asahi Shimbun, Kagome hopes the vending machine will highlight the fatigue-reducing, high-nutritional value of tomatoes. "I recommend runners have one after jogging to supply nutrition," a Kagome official is quoted as saying. The vending machine offers two different sizes of tomatoes: a 280-gram bag for 400 yen ($3.80) and a 180-gram bag for 300 yen ($2.80). Stock is replaced every other day to ensure freshness. Previously, Japan has seen vending machines with apples and bananas. This tomato one isn't a first, though. Rural Japan has already seen a couple tomato "vending machines," created from converted coin lockers by local fruit and vegetable sellers. Kagome's tomato vending machine will be in operation until February 23, when the Tokyo Marathon commences.